The conclusion of Edward Copeland's retrospective on the series featuring new interviews with several cast and crew. at St. Eligius, an opera singer with laryngitis. "Returning to St. Eligius: St. Elsewhere, 30 Years Later - Part 3" has arrived, published on November 8, which was also Norman Lloyd's 98th birthday. Part one of this series at PressPlay focused mostly on the first season. Part two adds more stories about season one and widens the scope considerably. For the second installment, Edward Copeland interviewed Christina Pickles, Ronny Cox, Channing Gibson, Cindy Pickett, Bonnie Bartlett, David Birney, Jennifer Savidge, Joshua Brand, Cynthia Sikes, William Daniels, Mark Tinker, David Morse, Nancy Stafford, Stephen Furst, Ed Begley Jr., Terence Knox, Norman Lloyd, Blythe Danner, Ellen Bry, Michael Dukakis, Edward Herrmann, Piper Laurie, Chad Allen, and Sagan Lewis. Parts two and three are considerably longer than the first installment, and they are loaded with great stories from cast members, guest stars, and producers, as well as analysis and insight from the author. Much as part one focused on the first season, part three covers the last. As a whole, Edward Copeland's series of articles joins the ranks of Robert Thompson's Television's Second Golden Age as one of the most thorough explorations of the show ever undertaken. It's a definite must-read for St. Elsewhere fans. Copeland touches on St. Elsewhere's odd timeline, where six seasons cover three years of fictional time. According to Ronny Cox, NBC's censor resigned over the network's decision to air "A Moon for the Misbegotten". Channing Gibson explains the formula for an episode: an overarching theme, a personal story that delved into one of the characters' personal lives more deeply than normal, a medical story, and a humorous story. Jennifer Savidge did her scene in "Bypass" with a severe concussion. The puppeteer (played by Alan Young) who abducts Ehrlich in "A Coupla White Dummies Sitting Around Talking" claiming to be the true inventor of the Craig 9000 artificial heart was based on Paul Winchell, the ventriloquist from the 50s and 60s who later voiced Tigger in Winnie the Pooh and also invented and patented an artificial heart in 1963. A recollection of Mrs. Hufnagel, played by Florence Halop, who would apologize after her scenes for being so mean. The story of "Time Heals", the mythology-packed two-part episode that earned four Emmy awards. Stories about Ed Flanders, whose personal demons made him difficult to work with, but who was greatly respected and admired for his talent. Great tribute to Norman Lloyd, who at 98 has the sharpest memory of anyone involved with the show; endless words of praise for the legendary actor and raconteur. 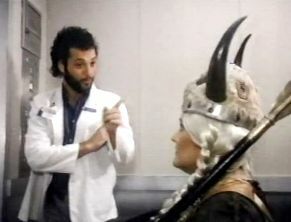 A discussion of the series finale, including an alternate version set in 2013 centered around doctors Timothy White and Pete Morrison, plus nurse Barbara Craig, with Auschlander still alive and Fiscus completely bald. Stories of how the writers would inject real-life dialogue and events into episodes. Much, much more good stuff. Great recollections from all involved. Season two, "Qui Transtulit Sustinet": Jack Morrison (David Morse) listens to the beating of his dead wife's heart in the chest of transplantee Eve Leighton (Marian Mercer). The end of the legendary series finale, "The Last One".